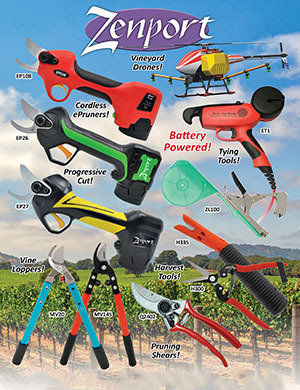 Koham Battery Operated Electric Pruners are designed for use by professionals in the agriculture, vineyard, and orchard industries, for anyone involved in commercial landscaping, tree service, forestry, and park maintenance, and by the home gardener. All will enjoy the benefits of Speed, Efficiency, Reduced Pain, and Reduced Stress Related Injuries. Kit comes complete, including pruner, battery, charger, cables, tool carrier, spray oil, and work vest. battery provides the power to cleanly and quickly accomplish the desired cuts throughout the day. Brushless Motor is more efficient, creates less friction heat, and eliminates motor brush maintenance and replacement. When needed, repairs are completed at our sales & service office in Portland, OR. Our cutting blade is made of high quality SK5 Japanese steel. High quality durable harness makes for comfortable easy handling while you prune. Virtually eliminate lost time and medical expenses related to Repetitive Motion and Carpal Tunnel injuries. Reduced hand fatigue increases workday productivity by up to 40%. Reduce labor cost up to 30%. A cleaner pruning cut allowing for faster healing. Works efficiently in tight and restricted spaces. Less cumbersome system, fewer tools to carry. Less environmental disturbance with quick quiet cutting. As little as 1 YEAR return on investment. A better working environment, workers appreciate less pain and stress. Checkout the Zenport EP3 Large ePruner Variable Trigger Battery Powered Electric Pruner, 14-Hour, 17000 1.5 inch cuts, EZ connect Black 9-PIN connectors, with highly visible orange cord. 14-Hour Battery Powered Electric Pruner, 17,000 1.5-Inch Tree Cuts. The newest and lightest E-Pruner electric pruner technology from Zenport Industries. The Zenport Battery Powered Electric Pruner, features a powerful 4.4AH 36V lithium battery. At full capacity, this battery will last a full 12 hours and will complete more than 17,000 cuts on 1.5-inch branches. The Zenport 9-PIN POLEKIT 78-Inch Pole Extension Kit for EP2 and EP3 Battery Powered Electric Pruner. Everything you need to extend your battery powered electric pruner 7.2-feet so that you can reach those branches and limbs without the use of a ladder. The kit also comes with a safety strap to help tether and add leverage to the pole for easy handling. Pole includes a 24" foam grip that provides comfort and also softens any impact with the lower portion of the pole. The handle trigger includes a safety lock to prevent injury and damage from unintentional activation of the cutting blade.